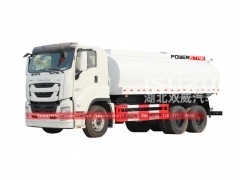 ISUZU GIGA Water Tanker Trucks (also called Isuzu GIGAWater Tank Sprinkler Truck, Japan GIGA water bowser, water tank lorry ISUZU, mobile water truck, water carrying truck, truck mounted water tanker, GIGA Pressure Washer Bowsers) are used to deliver potable drinking water and non potable water for dust control or any other specific use that non drinking water can be used for. Our tanks transport water that is dispensed through a pumping system either through a hose reel for delivery or through a series of spray heads and nozzles to spray the water in different directions. 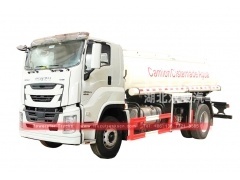 ISUZU GIGA Water tanker trucks are used to deliver potable drinking water and non potable water for dust control or any other specific use that non drinking water can be used for.